An excellent 1855 first edition example of Colton's map of Brazil, British Guyana, French Guyana (Cayenne), and Dutch Guyana (Surinam). Covers from Venezuela to Uruguay and from the Amazon basin to the Atlantic. Inset maps in lower left quadrant detail Pernambuco and Rio de Janeiro. 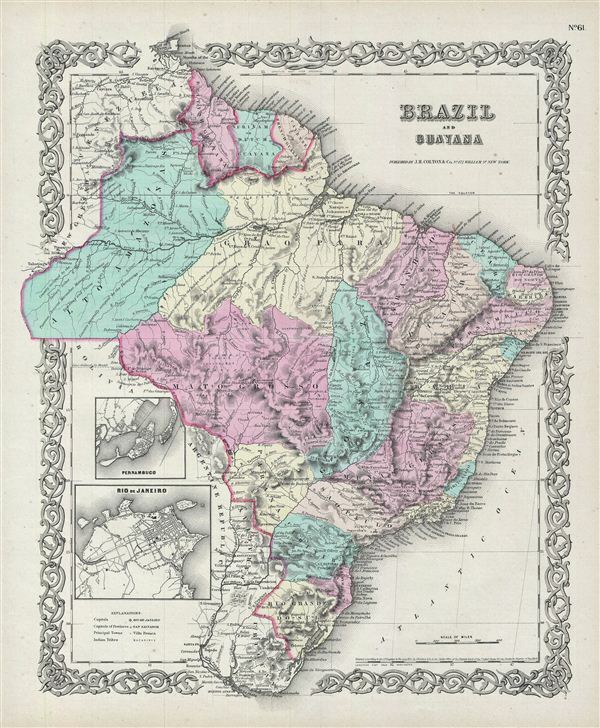 Brazil was a this time an empire under the control of Pedro II. Much of the 1850s was a period of Prosperity for Brazil due to Pedro's maturation and consolidation of power. This map identifies various cities, towns, forts, rivers, rapids, mountain passes, fords, and an assortment of additional topographical details. Map is hand colored in pink, green, yellow and blue pastels to define national and regional boundaries. Surrounded by Colton's typical spiral motif border. Dated and copyrighted to J. H. Colton, 1855. Published from Colton's 172 William Street Office in New York City. Issued as page no. 61 in volume 1 of Colton's 1856 Atlas of the World. Rumsey 0149.066 (1856 edition). Phillips (Atlases) 816.